Bahamian Crab N Rice is a authentic Bahamian dishes. Passed down for generations. Conch Fritters are sold all throughout the Bahamas where conch is the national food. 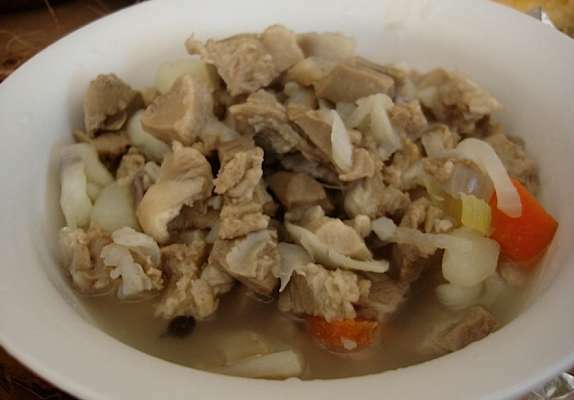 Souse is a very simple Bahamian soup made with meats like chicken, turkey, pig's feet or sheep's tongue. After you have climbed the tree, cut down the coconuts, poured out the water, what do you do with the meat of the nut? Well, every Bahamian knows if it’s jelly it goes in the water, but if it’s hard it goes in dessert. The perfect complement to this cake is a tall glass of coconut water and milk. Sift dry ingredients together. Cream shortening; add sugar gradually; cream together until light and fluffy. Add unbeaten eggs one at a time, beating thoroughly after each addition. Add vanilla & coconut. Add dry ingredients alternately with coconut milk, stirring only to blend. Bake in 2 8″ layer cake pans at 350° 20-25 minutes. Frost layers with confectioner’s powdered sugar creamed with margarine or butter, dash of salt and vanilla, thinned with more coconut milk & generously filled with chopped or coarsely grated coconut. Also, sprinkle coconut on top & sides of cake. Bahamas CookBook Download Here ! !